Almost two years ago, I painted a magnetic white board onto the wall of my office. I thought I’d give an update on how it’s fared: it’s fantastic. You can see it’s pretty dirty–that’s because I haven’t cleaned it ever until this weekend (and then I only did part of it). It usually has notes of some sort on it–story plots, to do lists, in this case a list of things I might want to buy some day. The paint that I bought recommended not making a magnetic white board (the suggest chalkboards), but it’s turned out quite well anyway. I should have sanded the wall down some more, or smoothed the paint in some other way. It works fine, but it’s harder to erase the spots that aren’t even because the eraser can’t get in there. The only downside is that I only have one. I wish it were bigger, but I made it to fit the wall space that I had. 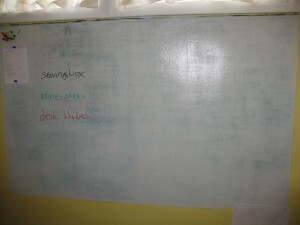 When I’m plotting a novel or story, there isn’t room on the white board for anything else. I’m starting to think about my next novel, but first I have to diagram my vegetable garden.